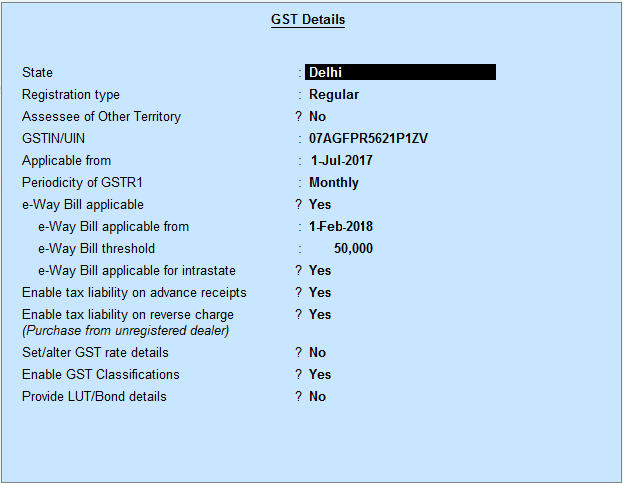 Home / GST-Tally / How to Generate E-Way Bill through Tally.ERP9 Release 6.4? 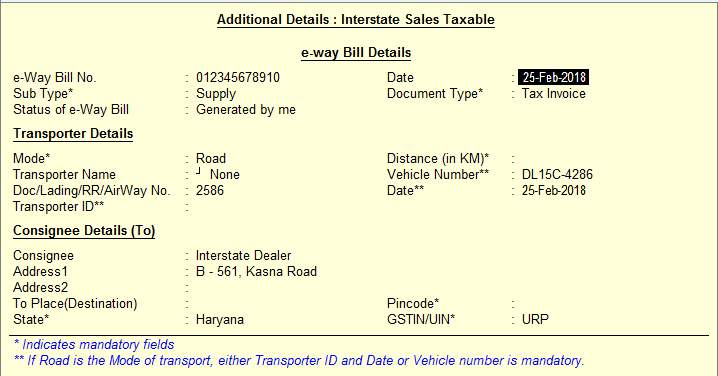 How to Generate E-Way Bill through Tally.ERP9 Release 6.4? First option, Through Direct update you can update your Tally software. Press Ctrl + Alt + T to go Product and Features option. There is you can see update of Tally Release 6.4 available, press F6 to update your system. Tally ask you to select yes 2 times, click y to select yes and your system will update in few seconds. Second Option, You need to download Tally Installer from Tally Solution website and install this. Surrender your existing license and re-activate your license in latest Tally after installation. 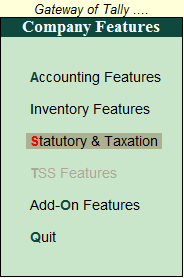 After update your system Press F11 for Company features where you found statutory and taxation tab. You can see there is option to provide your Company GST details like, State, Registration type regular or composition, GST Number, date from which GST applied, GSTR 1 filing applicability, and E-Way bill details. Select E-way bill applicable to yes, enter applicable date and threshold limit is left to 50000 because generating of Eway bill is mandatory to invoice more than Rupees 50000, select Yes to intrastate E-way bill where you supply goods more than 10 Kilometers. Select rest options as per your requirements. Now create a sales voucher, Enter party name, enter dispatch details (to enable dispatch details - press F12 and select Supplementary details to yes), select tax ledger CGST, SGST or IGST. Now you can see the option "Provide GST/e-way bill details:" select yes to this option and details of E-way bill is open on your screen. If you enter dispatch details at the time of enter the party name in voucher then lots of details in will be pre-fill in E-way bill details, or otherwise you need to enter manually. You do not need to enter Transporter details, Just select E-Way Bill details option or press Ctrl+ W on E-way bill details screen. Following details appear on your screen. Enter E-way bill no., date, type of supply (there is lots of options to select which is Exhibition or fairs, Export, for own use, Job Work, Line Sales, Others, Recipient for Unknown, SKD/CKD or supply. Enter complete details of transporter and vehicle details and save the voucher entry. Now go to Gateway of Tally - Display - Statutory reports - GST - EWay Bill - Update E-way Bill Information. Press Ctrl + G for pending for export. This will generate error details showing in generate Eway Bill. Details of pending information appear on your screen, just resolve and press Ctrl + E and export your file in Json Format. Default location of export path automatically open on your screen. You can also create multiple E-Way bill and create json file for all eway bill.